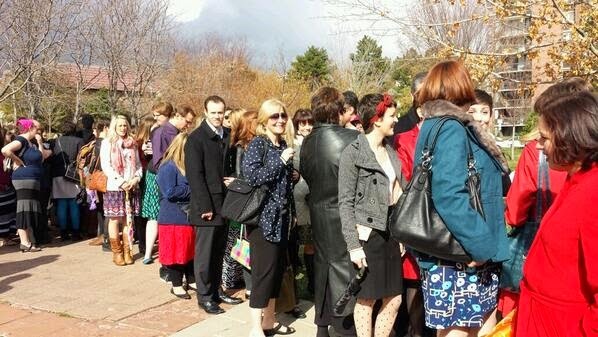 In the lead-up to and aftermath of the recent General Conference Ordain Women action, many Very Serious Mormon Men have taken it upon themselves to critique the movement for reasons they assure us are entirely benign and even helpful. In that spirit I decided to add one more voice to the ongoing conversation at about women in the church. Just to establish this up front, I'm not against Ordain Women. Now, that's not to suggest that I support what they're doing or how or why they did it, but I get their concerns. I sympathize deeply. I also don't question their sincerity, that they're doing what they think is right. In a sense, I'm on their side: if the Lord ever extends priesthood to women, I'll be the first to celebrate it. I know many women who'd make excellent administrators, teachers, and leaders in the church. In fact, some of my best friends are women. But that's not why I'm writing today. Because I firmly believe that before we engage in a substantive debate on the merits of female ordination--which is entirely in the hands of the Lord and beyond my purview--I think it's critical that we narrowly examine the particular tactics Ordain Women has used, and how I couldn't possibly support the movement as a result. For starters, I'm uncomfortable with their having chosen General Conference as the venue for demonstration. It seems deeply inappropriate to petition the Brethren when they're gathered as a body to minister to the church instead of going through proper channels. And while I realize that many women have been writing letters and expressing concerns to local priesthood leaders for decades, it's important to remember the the Lord's house is a house of order, that things are organized the way they are for a reason, and that we must respect His way of doing things. Petitioning the Lord is admirable, but the Church isn't a democracy. Second, can we talk for a minute about the semantics of Ordain Women's "action"? It's clearly a protest, so why not use the word? It implies that there's something to hide, which turns neutrals like me off. While I would never protest the Lord, we should be honest about what's happening. I'm also disturbed that there are members of OW leadership who may not be fully active church participants, and some who aren't even Mormon at all. I cannot understand how anyone could criticize or give advice to an organization they claim interest in without being fully invested. Furthermore, having seen videos of public Ordain Women gatherings, I've noted that several of their leaders' speeches have been met with applause and cheering. I don't know about them, but I have never attended a church meeting where faithful members behaved that way. If you seek God's power, shouldn't you follow His pattern of reverence? I'm also disheartened by the way that many OW supporters implicitly dismiss the very real progress that the church has made on women's issues in recent years. The church cleared many of the barriers for young women to serve missions by lowering the minimum age. It allowed women to pray in General Conference. It hung pictures of women in the Conference center. Frankly, the fact that OW carried on in spite of this underscores a fundamental unreasonableness, an unwillingness to acknowledge progress. The "all or nothing" approach makes it abundantly clear that they won't be satisfied until their demands are met, which strikes me as selfish. You don't make demands of the Lord; he makes demands of you. Finally, As Elder Oaks made clear in His Priesthood Session talk, the issue of women's ordination is settled doctrine. Requesting that leaders pray about changing doctrine is the peak of hubris, and suggests a lack of testimony in the Lord's appointed servants, which in some ways indicates a lack of testimony in the Lord. I wouldn't compare Ordain Women to Korihor, but isn't this exactly what Korihor did in the Book of Mormon? My only real wish is that OW had behaved differently at every point. Less confrontationally. Less publicly. Had they done so I still wouldn't support them, but I would feel much less uncomfortable about seeing the whole thing unfold. Frankly, as one who theoretically supports the hypothetical idea of women being ordained at some unspecified future time, it's tremendously difficult to be a moderate in times like this. I hope I've made it clear that I'm really not against Ordain Women, just what they say and do. Mostly I feel it's critical that voices like mine--those of male priesthood holders in positions of authority--not be drowned out. The best . I love you for writing this- even as it aches to read it. As a woman, I am just offended that these other women are trying to do things that I don't like. I mean, why won't they just do things that I like instead? You know, like cooking, cleaning, shopping, etc. Leave that other "responsibility" crap to the men who totally know how to ties knots better than they can (thanks Boy Scouts!). Would pointing out that your argument seems to rely entirely on vague strawmen and lacks any concrete evidence demonstrate anything? P.S. Where is the contradiction is being pro-feminism and anti-activism? Jeff G - satire, my friend. Your memory is long, Jeff, although I confess to having left one or two drive-by comments on the internet in my days. Since when is it irreverent to applaud? My only real wish is that OW had behaved differently at every point. Less confrontationally. Less publicly. Had they done so I still wouldn't support them, but I would feel much less uncomfortable about seeing the whole thing unfold. Never underestimate the power of satire. This is a very helpful post for an interested outsider, that would be me, who is trying to wrap her brain around the entire issue. "I hope I've made it clear that I'm really not against Ordain Women, just what they say and do." Satire: Because everything sounds witty when you say the reverse of what you mean.